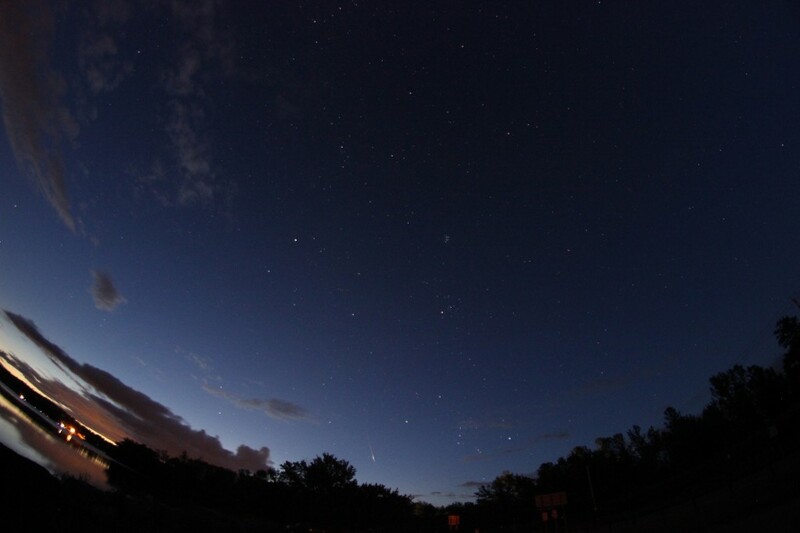 * 10 Aug – Perseid meteor shower: What’s the best night to see it in CNY? 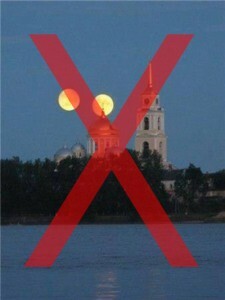 Our continued thanks to Glenn Coin and syracuse.com for covering the big yearly astronomy events! 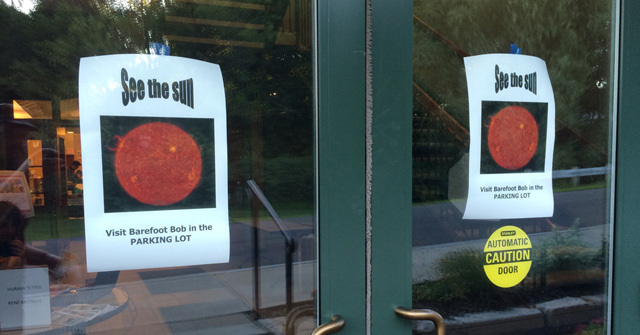 Our Perseid week actually started in the daytime, with a Solar Observing Session run by Bob Piekiel as part of a How-To Festival at Marcellus Free Library on Tuesday, August 11. Like the Sun itself, the Sun’s importance in irradiating comets as they pass into the inner Solar System and melt enough to leave the trails of cosmic debris that become our yearly meteor showers cannot go unnoticed. This session featured Bob’s Coronado 90 mm H-alpha scope, a small Baader’ed refracting scope, and Christopher Schuck’s Coronado PST. Over the course of about 90 minutes (from the session start to the Sun slipping behind the high tree line), we had about 25 people cycle past the scopes to observe numerous medium-sized prominences and a reasonably clear Sunspot 2396 (click the image at right for a larger view from NASA/SOHO). 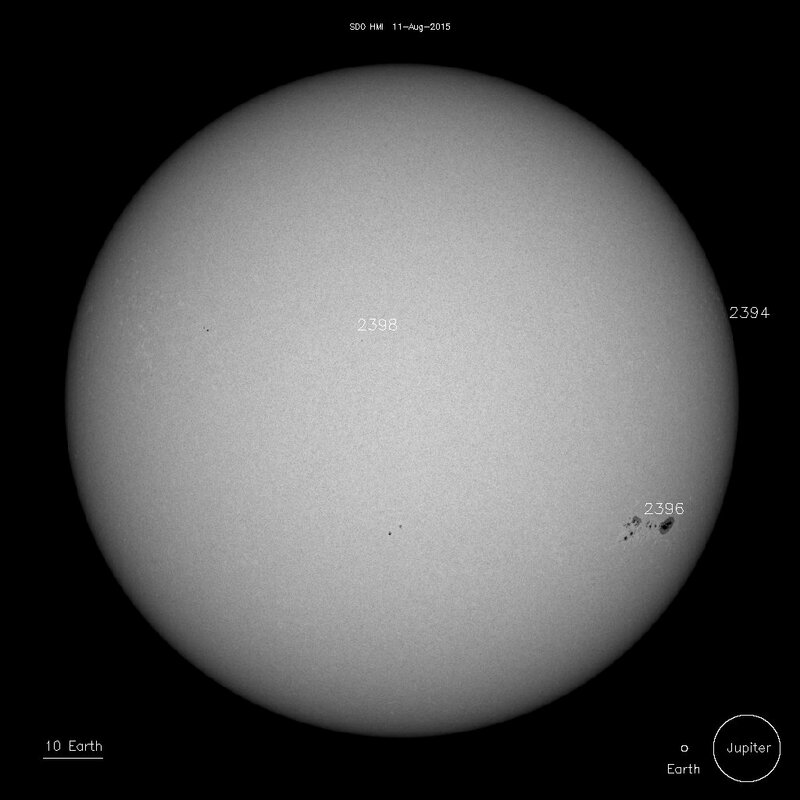 Besides the continuous dialog about all things solar, more than a few attempts to capture images through the scopes were had. 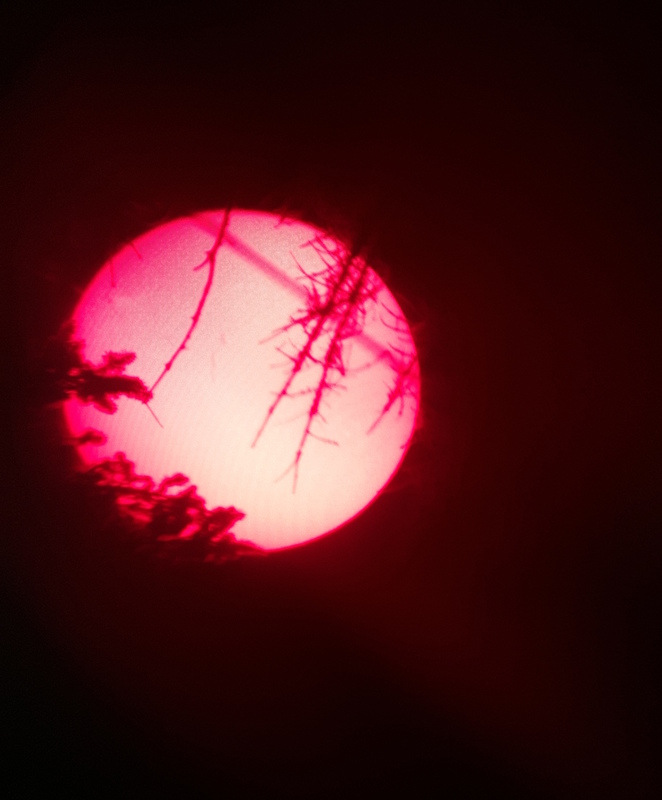 While smartphones are not the ideal gear for accomplishing this (due to both the difficulty in proper placement and the relative sensitivity of the sensors to monochromatic light (in our cases, the dark red H-alpha band)), Chris did manage a pic that included multiple prominences, one power line, and the ever-constraining tree line (below). Smartphone Coronado PST pic by Christopher Schuck. Click for a larger view. Bob and I handled scope and lecture duties for the three peak Perseid nights, hitting well-separated locations and a few overlapping attendees. As all three sessions were nearly identical in their content and observing targets, I’ll briefly summarize the unique aspects of each event before giving the combined (and nearly identical) observing lists. 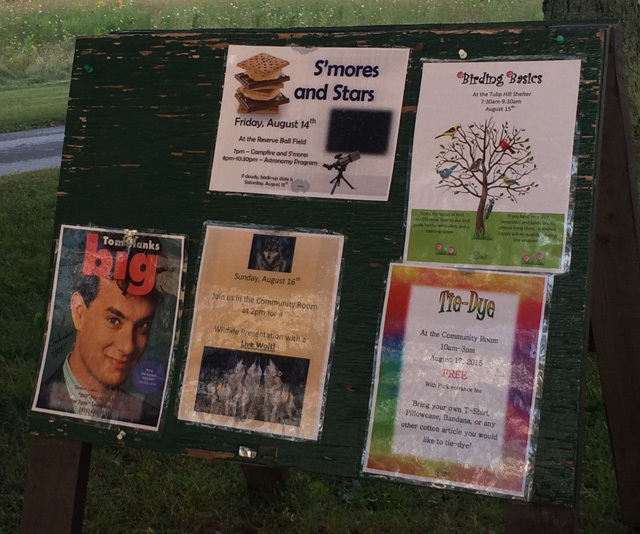 With the best time for the Perseids predicted to be between the late evening of the 12th and 13th, Baltimore Woods Nature Center was predictable busy. Attendees began to arrive around 8 p.m., with total attendance maxing out at about 65 people (and the parking lot itself maxing out before that). With an introductory lecture and white light warning provided, the entire 8:30 to near-11:00 p.m. session only included three shooting stars. Two were moderately bright (and fleeting). A third, the best of all three days, hit atmosphere above a large set of clouds, yet was bright enough to light the clouds like a green-twinged lightning bolt. Bob Piekiel and the calm before the storm. The evening itself turned out mostly cloudy, providing just enough open pockets of dark sky for views of Saturn, a few Messiers, some Constellation touring, one ISS pass, and the three observed meteors that graced the skies that night. Cloud cover became all-consuming just after 10:30 p.m. and we packed up and were gone by 11:00 p.m. In the interest of trying to catch at least one Perseid by photo, I trekked out to Cazenovia Lake around 4:00 a.m. in 30 minutes of trying, I managed only a single shooter (in the image below, it looks like a white arrow (at bottom) pointing to some dim objects). A sharp streak of a Perseid in an otherwise poorly-balanced image. Click for a larger view. CNYO’s official seasonal Beaver Lake Nature Center session was greatly simplified by having the Baltimore Woods session the night before (meaning Bob and I could attend both sessions with no overlap). With the session moved from the Beaver Lake rotunda to the overflow parking, we found ourselves in a darker, lower tree-lined, and easy to arrange location (meaning we may request that all future sessions be held in the same spot!). Beaver Lake skies were not much clearer than Baltimore Woods, but the waits between observables was shorter and our ability to cycle through objects and attendees was improved. With additional announcements on syracuse.com, the final Beaver Lake count was five meteors and about 75 people from our 8:30 introductions to 11:00 p.m. pack-up. Upcoming festivities announced during our session. Our Green Lakes State Park session in July peaked near 120 people (some for the stars, some for the s’mores), which is quite a crowd for 3 scopes! Despite the predictions of clearer skies than previous days and generally excellent evening weather, the August session capped itself at about 70 people (with a bunch of them being young amateur astronomers who packed it in early, leaving a smaller group of about 15 to stay until our 11:00 p.m. Ending to pick off several Messiers after Saturn slid behind Green Lakes’ high southern tree line. Going solely by “ooh-and-aah” statistics, Green Lakes attendees may have seen a total of 5 Perseids (none rivaling the one from Baltimore Woods, but easily seen in the mostly clear skies above). As has been discussed many times on this website, the importance of introducing new observers to easily observed and described objects cannot be understated. The hunt for dim NGCs and equally dim Messiers is always worthwhile with sufficient time and clear skies, but the brand new observer (arguably) benefits more from prominent views of objects such as the Moon, M13 in Hercules, Alcor and Mizar, M57 (the Ring Nebula) in Lyra, The Andromeda Galaxy (M31), and the bright visible planets each evening. These objects are easily seen by anyone approaching the eyepiece and can be used to give new observers a kind of “upper limit” on their expectations of what a scope is capable of magnifying from ground level. Amateur astronomy, like chess, can become a lifelong training in subtlety. That said, the mechanics are easy to learn by slowly introducing the many kinds of players. M13, M57, and M27. Photos by Bob Piekiel. Click for a larger view. In closing, we had an excellent week-long turnout for the sessions and are grateful to everyone who came out to make this a busy Perseid show. We hope all of the new faces on our meetup and Facebook pages keep track of upcoming events – and we hope to see your dark, featureless outlines at another 2015 session!